Firstly engaged with each other in ChinaPrint 2017, TechNova Imaging Systems and JWEI got to know each other in May2017. JWEI presented its LS and CB cutters at its own booth and Konica Minolta’s booth then. January 2018, TechNova and JWEI achieved anexclusive distributorship agreement for India market in terms of JWEI’s LS and CB series digital flatbed digital cutters. “…Enhance Offset and Integrate Digital. 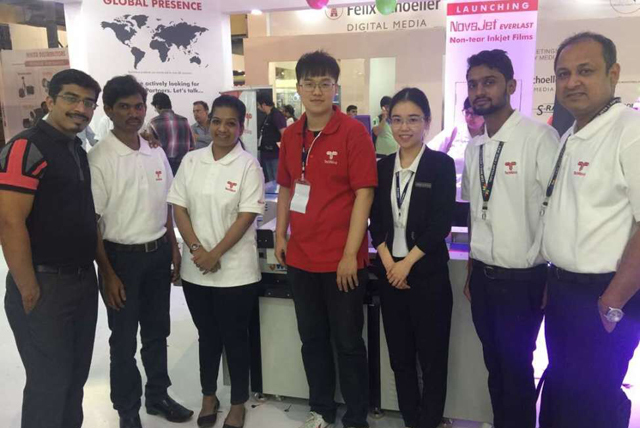 With JingWei, we are able to offer a robust and affordable solution to buildinnovative print products”, said as S Swarnangka, chief operating officer fordigital imaging solutions at TechNova. That's true, since JWEI's LS series and CB series digital flatbed cutters are one of ideal finishing solutions for traditional offset printingand digital printing especially for prototyping and short-run productions. TechNova is one of the world’s leading suppliers of Total Imaging Solutions for the Graphic Communications industry. Since 1971, TechNova has introduced several new breakthrough technologies thathave transformed the imaging processes in various industries. With considerable influence in the textile industry of India already, JWEI is pleased to have such a dependable partner in India with capacity of covering the whole nationof India in segments of printing and packaging and graphic arts, bringing extensive values to customers in India and cultivating JWEI brand in the industries. TechNova will showcase the JWEI CB seriesof digital flatbed cutting machines at Media Expo in Mumbai in February 2018.